While the overall U.S. economy is on one of its longest expansion periods in history, widespread concerns continue that too many communities are being left behind. Growth and opportunity are not spreading in a balanced or inclusive way. This has been attributed to factors such as rising levels of income and wealth inequality, increased costs of a middle-class lifestyle, and a lack of economic mobility. If you look at entrepreneurial activity in the United States on a geographic basis, the division between haves and have-nots is striking. The Distressed Communities Index, a report by the non-partisan Economic Innovation Group (EIG), ranked every county in America based on factors such as employment, income, education, homeownership, and new business formation to measure and rank the economic vitality of U.S. counties relative to their peers. Counties were divided in well-being quintiles – Prosperous, Comfortable, Mid-Tier, At Risk, and Distressed. These quintiles wereeach made of up of approximately 600 counties facing progressively greater social and economic challenges. New business formation in the counties populating the lower quintiles were depressed to non-existent. At eBay, we believe that providing open, global, technology-enabled commerce platforms to independent small businesses and entrepreneurs, connecting them to millions of buyers around the world, empowers a people-driven kind of inclusive global commerce. eBay delivers the latest technology-driven retail tools and innovations to local merchants and entrepreneurs, opening global opportunities and providing a boost to Main Street small businesses whether they are thriving in a growth hub or faced with a deeply challenged local economy. And we wanted to see if the data on small business entrepreneurship on eBay confirmed that our commerce platform was truly pushing back against these negative national trends toward economic concentration. The eBay Public Policy Lab analyzed the growth in the number of eBay Commercial Sellers — small business sellers engaging in at least $10,000 in sales on eBay per year — on a county-by-county basis from 2011 to 2015, looking at the results along the well-being quintiles established by the EIG Distressed Communities Index. The same county-by-county analysis of net enterprise formation was also done for the overall economy using U.S. Census Bureau data. 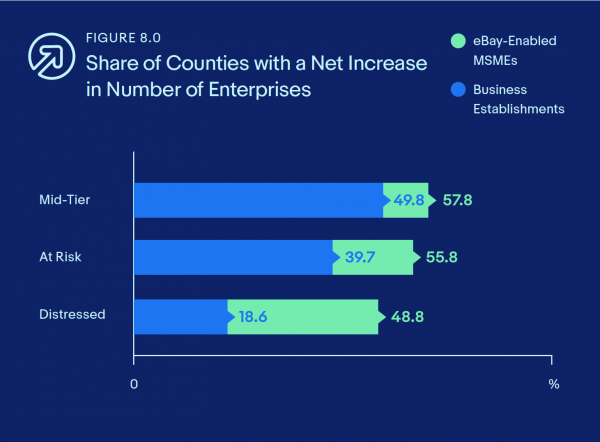 The eBay Public Policy Lab report confirmed that net enterprise formation on eBay was meaningfully more balanced and inclusive than was occurring in the overall U.S. economy. A geographically balanced economy is one in which people enjoy a relatively equal opportunity to benefit from economic growth, regardless of where they live. On the other hand, an economy where economic opportunities and growth is highly concentrated in a small subset of communities is out of balance. 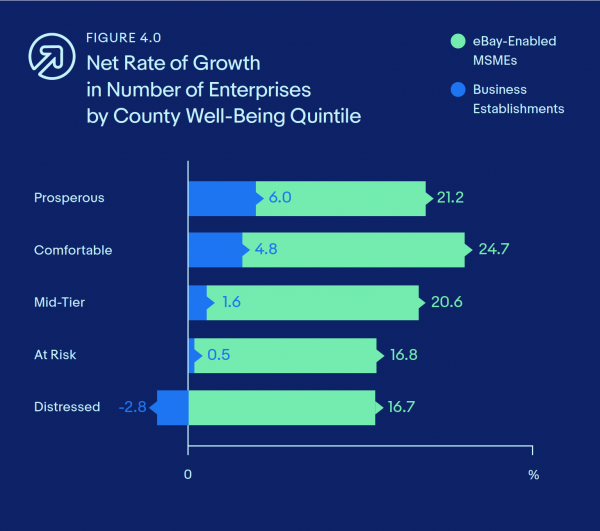 Based on rates of new enterprise formation in counties spanning the EIG Distressed Communities Index, eBay small business growth was 5.7 times more balanced than in the overall economy. Yes, the number of eBay small businesses in the top two well-being quintiles increased 21.2% and 24.7%, but the growth rates in the bottom two quintiles were also robust at 16.8% and 16.7%. Compare that to the overall economy where growth in the number of business enterprises in the top two quintiles was 6% and 4.8%, but in the bottom two was an almost non-existent .5% and negative 2.8%! Taking a step beyond balance, an inclusive economy provides opportunities to those who are less advantaged. We therefore focused attention on growth in the number of enterprises across the bottom three EIG county quintiles, those being Mid-Tier, At Risk, and Distressed counties. Those counties are home to nearly 100 million Americans! Again, the data revealed that eBay Commercial Seller growth was substantially greater than traditional establishment growth to the tune of 19.3% vs. less than 1%. In addition, we looked at the contribution to overall enterprise growth coming from those counties. On eBay, they contributed 20.4% of growth, while in the overall U.S. economy, less than 4% of all the enterprise formation came from those more-challenged counties. In short, eBay small business formation was 5.6 times more inclusive than the overall economy. We must not lose sight of the fact that there are real people behind these numbers. The ability to harness technology to allow a local entrepreneur in an At-Risk or Distressed county to improve their economic prospects, and with them their local community, pays real dividends in people’s lives. For example, Spencer Apland is an eBay seller from Josephine County, OR, which shed nearly 4% of its business establishments from 2011-2015 and is classified as an At-Risk county in the EIG index. About ten years ago, Spencer was in business school but not quite sure of the career path he wanted to pursue. A do-it-yourself mechanic, he bought a wrecked car for parts to fix his own vehicle and had a revelation: maybe he could sell the “leftovers” on eBay. One sale led to another, and pretty soon he was moving enough units to quit school and start his own business. 541-Motorsports was born and began operating in a 1,200 square foot warehouse, which it outgrew in one year. By 2015, 541-Motorsports continued its rapid growth and pace, and Spencer began adding employees and square footage to try and keep up with the increasing business demand. He eventually brought his wife Megan into the business full-time along with two other employees and moved to a 2,500 square foot warehouse, which they quickly outgrew again. Today, 541-Motorsports has eight full-time employees, 15% of their sales come from exports largely facilitated by eBay’s Global Shipping Program, maintains a 20,000 square foot local warehouse and is a technology-powered independent small business growing in a challenged local economy. The increasing disparity in opportunities available to people living in disadvantaged communities vs. those for Americans living in booming hotspots is a valid and growing concern. Instead of blaming technology and global commerce, they help entrepreneurs access customers across the U.S. and around the world and help regions that are falling further behind. The results are more balanced and inclusive economic opportunities and stronger communities across the country.